Start with one. Go up and down from there. Of course, the next step up from one is two and the next step down is one-half. But we can’t get there going at that rate. So instead, I’ve made the step in bunches of ten. 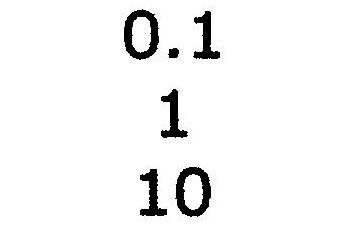 Binary comes hard to ordinary folk, who think naturally in groups of ten: fingers, toes, so forth. I have arranged the numbers so that going up in numbers goes down the page because I use this scheme to talk about time into the past, which always goes down the page to the geological mind. Lower down is older, at least for rocks that are laid down in layers, like these numbers. Lets take another step. A shape begins to emerge. One diminishes to one-tenth, then one-hundredth, going up the page and augments to ten and one hundred, down the page. If you start with a dollar, it’s gone down to a dime, and then to a penny (up the page). The other way, it has increased to a tenner,then a c-note. The difference between the top and the bottom of the figure is the difference between finding a penny on the street-would you bother to pick it up?- and finding a one hundred dollar bill. I found one once and I still have it! As the numbers get bigger and smaller, they begin to lose connection with daily experience, which is why it is so easy to goof up things. But we must press on anyway. 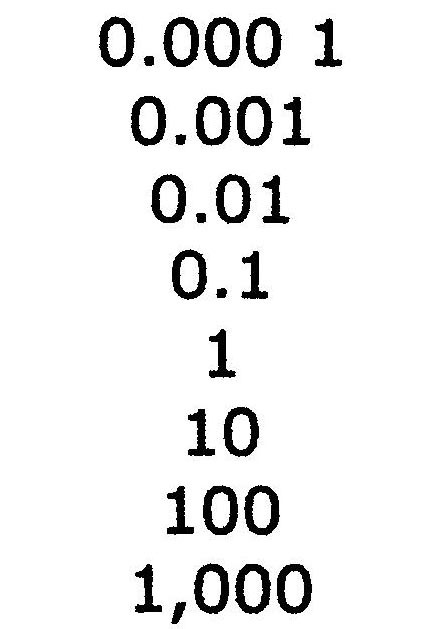 Now the zeroes are beginning to stare out of the page at us. And we are about to start running short of words. That is, in English we have separate words for one, ten, hundred, and thousand. But after that, the next new word is further off, at a million. 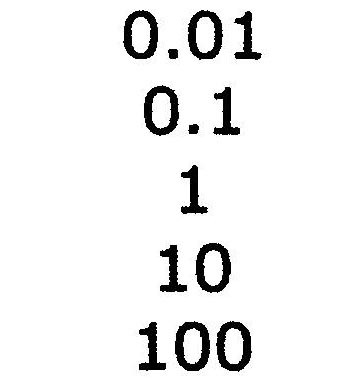 We use combinations of words that imply the mathematics of multiplication to talk about what is next after a thousand. Engaging the mathematics is not daunting at this stage, but as we go along, it becomes a real problem. In other languages, notably Sanskrit, there are separate words for ten-thousand (ayuta) and one-hundred thousand (laksha). Well, you can see how it is going. Pennies, dimes and dollars. Or, applying the scheme to time, starting with 1 year, it goes up to decades, centuries and millennium. Start with this year, go back to 2000 (Y2K), thence to 1,000 AD. Or go forward 0.1 years- about a month, then forward about 3 days. Now let’s look at something really big. Gaze in awe at the numbers. Most of them have no names in English. Even in Sanskrit, there are variations in name usage. It boggles the mind. Fortunately, it can be thumb-nailed. Use this image to remind you of the Big Picture. And you can scroll back to the legible form for re-assurance if you like. You can see that you can continue the process of adding rows to the top and bottom without end. That process would take you to smaller and smaller numbers, going up the page and bigger and bigger numbers down the page. If you combine two familiar processes, one of doing something repetitively, over and over and over and over, then the process abruptly comes to completion, you get to a metaphorical understanding of what it would mean to extend this diagram indefinitely in both direction. Even though you can’t actually do something forever and ever, you can figure out what completion result you would obtain if you could. Zero at the top. Infinity at the bottom.